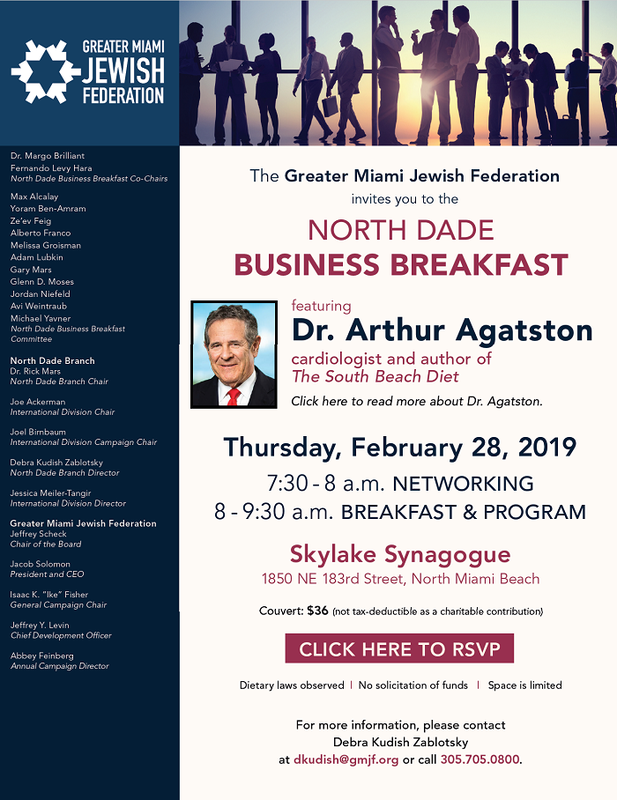 The Greater Miami Jewish Federation invites you to join us for the North Dade Business Breakfast featuring Sammy Schulman, Executive Vice President and Operations/CFO of the Miami Heat and American Airlines Arena. Sammy can also be found assisting with player and sponsor contracts, spearheading organizational and strategic planning issues, and developing and maintaining financial reports, operating budgets and insurance. Sammy is one of the Heat’s eight original employees and has been with the team for 25+ years. The program will be held on Tuesday, February 27, 2018 at 7:30 am with time for networking prior to the breakfast and program. We will be distributing a directory of participants. If you would like your name and contact information to be included, you must register online by February 20, 2018. Please be sure to fill out all fields so we have your business name, your preferred email and phone number. For more information and to RSVP, please click here or contact Debra Kudish at dkudish@gmjf.org or call the North Dade Branch office at 305.705.0800. Please join us for the North Dade Business Breakfast on April 5 at Beit David Highland Lakes Shul ( 2600 NE 209th St, Aventura). This is a great networking event followed by the main program featuring Richard Fain, Chairman and CEO of Royal Caribbean Cruises Ltd.
Richard became the cruise line company's chairman and CEO in 1988, and has guided its growth to its current place on the S&P 500, as well as its listing by the Ethisphere Institute as a 2016 World's Most Ethical Company. Networking will begin at 7:30 am and the main program will begin at 8:00 am. 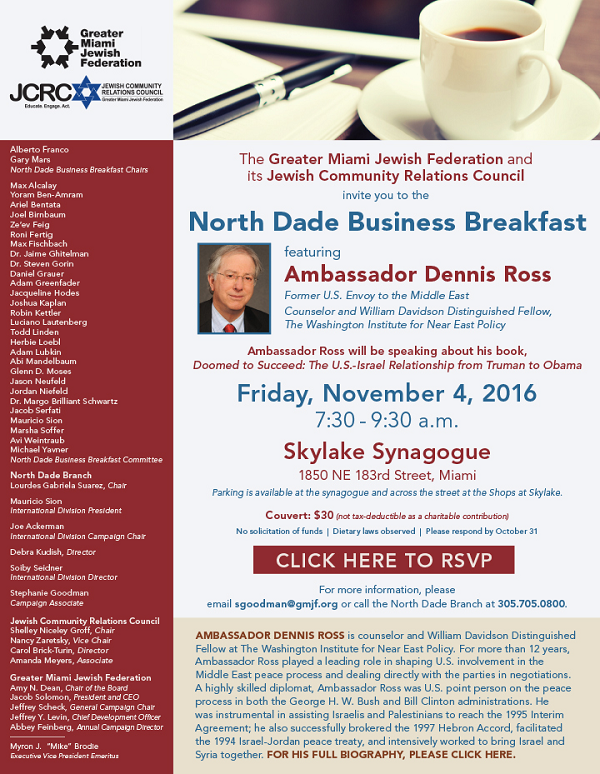 Join us at the next North Dade Business Breakfast featuring Ambassador Dennis Ross, Former U.S. Envoy to the Middle East. This is a great networking event followed by an important conversation. For more than twelve years, Ambassador Ross played a leading role in shaping U.S. involvement in the Middle East peace process and dealing directly with the parties in negotiations. Ambassador Ross will be speaking about his book, Doomed to Succeed: The U.S.-Israel Relationship from Truman to Obama.